And now for something a little different. This is the solarium off the dog wing in a photo I took back in January. Amazingly, there is now no snow outside at all — just a rare piece of ice is all we have left to show for the?winter that barely was. (I’ve only plowed three times?– I might do that in one week in a normal winter!) But the greens still look that good today, and we eat a lot of them all winter long. In fact, we have salads almost every day, and these 7 raised indoor beds — planted with Bronze Arrow Lettuce, White Russian Kale, and Giant Winter Spinach — provide all of our greens from October until May. Not only that, but we’ve been able to provide all the greens for our laying flock of hens during the same time. Every day I harvest some for them, including the left-over stuff — broken lettuce leaves, kale stems, etc. They eat it all. That solarium is only seven feet deep, and about twenty?feet long, so it’s not a big space, but the plants keep growing (although slowly) through the winter. The key is to get them planted early enough, in late summer, so they are fully grown by the start of fall harvesting. Once we get to February and more daylight, the plants increase their growth rate again. At night, we have thick canvas “weather curtains” that we roll down to close off the dog room from the solarium to minimize heat loss. The curtains let just enough heat through that it stays above freezing in the solarium, though on really cold nights we lay row covers over the beds that line’the front windows. I’ve got new spinach seedlings starting in one bed, and Alayne has hundreds of onions starting on tables in the dog room set next to the solarium. It gives them enough light to germinate. So this small space really does wonders for food production. It looks wonderful and luscious! That looks delicious. I’m about to start my seeds for my garden perennials. I can’t wait for weather that’s just a little warmer. Wow. I am very impressed. I tried a windowsill garden one winter, and it was very disappointing. This looks gorgeous. Love the raised garden beds. I’ve been thinking of investing in some. Did you have these made for you? or did you buy them somewhere? Love to know the dimensions and height of the boxes. A building pattern or where I could get one. Bonny and Paulette, we got the beds from this outfit several years ago (and cheaper! ):http://www.gronomics.com/product/elevated-garden-bed-24x48x32-unfinished Used regular potting soil. These are beautiful! Did you design and build these yourselves? About how tall are they? How much soil – – and what kind – – did you use, total? Are there plastic liners of some kind? The greens not only look healthy but very pretty, too. Well done! 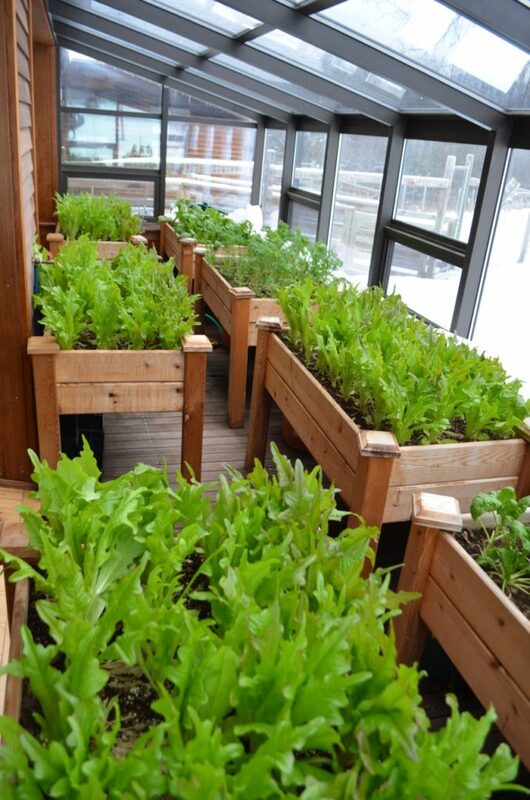 I’m green with envy…….what a great space for growing in winter. The people who designed and built the buildings on your property certainly added some nice features, and you were lucky to find this when you moved from Montana. And I’ll bet with all those greens, your chickens lay eggs with really deep yellow yokes. Everybody benefits! And I’ll bet it nice to just walk to another wing of your house to tend this garden, instead of putting on your outdoor gear to go to a separately located greenhouse. So many pluses here. Cliff and I have been talking about doing some raised beds like this……and getting a little greenhouse. What an ideal way to grow!